Ever wanted to be a rock star? Stand on a stage and sing your heart out for a packed show? See your picture plastered all over album covers? Well, as we so often hear, that sort of stardom doesn't happen overnight in real life. Apparently, it doesn't happen in anime either, because it takes twenty-five episodes for Yukio Tanaka, the protagonist of Beck: Mongolian Chop Squad, to make it big. 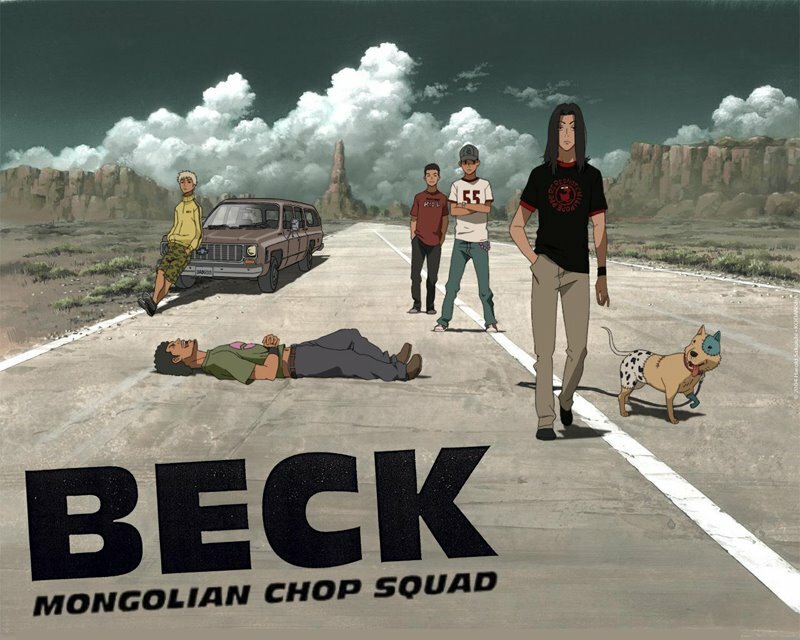 Beck is a story of slow successes. Really, really slow successes. Yukio begins the story as a lowly middle schooler, with nothing going for him except for a vague interest in swimming and a childhood friend that he's crushing on. After a chance meeting with a sixteen-year-old guitarist named Ryusuke "Ray" Minami, Yukio dives headfirst into the world of rock and roll. He borrows CDs from his childhood friend Izumi and takes guitar lessons from his swim coach Saito, with no real goal except to impress Ryusuke. 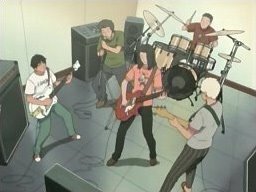 Eventually he joins up with Ryusuke's band, Beck, and the group (Ryusuke on lead guitar, Tsunemi Chiba on vocals, Yoshiyuki Taira on bass, Yuji "Saku" Sakurai on drums, and Yukio on rhythm guitar and vocals) struggles to "Hit in America" – the title of the show's OP – by climbing up the indie charts in Japan. Meanwhile, Yukio struggles with a complicated love triangle between him, Izumi, and Ryusuke's sister Maho. It's important to note here that nothing happens quickly in Beck. It takes quite a few episodes for Yukio to even get a guitar, and it takes him much longer to learn it. Then it takes him a similar amount of time to get over his crippling wimpiness and approach Ryusuke. Finally, it's almost halfway through the series by the time he is actually a member of Beck. Hell, he doesn't even have his mind made up about who he has a crush on until the halfway point. As cool as it is to see a wimp transformed into an awesome rocker, and as novel a concept as it is to show this as a realistically difficult process, none of these things contribute to Beck actually being enjoyable. It begins with potential, but quickly sputters out as it turns into a series of dismal failures on Yukio's part. There's so much whining and so many excuses in the first half of the series that you just might mistake it for Evangelion: The Musical. The second half picks up a bit, and eventually reaches a climactic 5-episode-long concert scene that manages to keep things rolling for a surprising length of time. Still, wading through the sludge that is episodes 1 through 20 is painful, which gives the sweet final scenes a bit of a bad aftertaste. Further, the animation reeks with the kind of half-assed, sloppy vectorized style that marred director Osamu Kobayashi's notorious stint on Gurren Lagann (episode 4), and serves as a stern reminder of why digital animation is not always better than cels. Character designs will occasionally be drawn completely wrong, and there are moments where faces in the background of a scene will be wordlessly gesticulating for no apparent reason. It feels like this was made on a tight schedule and/or with very low production values, or that there was minimal communication between different parts of the animation team. The only parts that ever look very good are the guitar scenes, which are lovingly animated in full cel-shaded 3-D. But hey, at least the music's good, right? The songs are a lot of fun, as they span everything in rock and roll, from pop-rock to blues to Chili Peppers-esque rap-rock. The riffs are quite catchy, even if you only catch bits and pieces of music each episode up until the final show. Sadly, a lot of the Engrish from the original Japanese makes the lyrics sound comically awful, even when translated into their slightly-improved English dub counterparts. Unfortunately, Beck is very difficult to suggest to most people. It's got great music, a realistic, down-to-earth premise, and an awesome final stretch. It's almost worth it to get through the twenty episodes that it takes to reach the rocking finale of the series, but in reality the bad pacing and even worse animation make Mongolian Chop Squad a chore to complete. Interestingly enough, however, Beck seems to almost be teaching us, whether by accident or not, the essential discipline of music: If you can get through the hours and hours of grueling practice, you'll find that all of the beauty and awe lies just on the other side.